A graphical guide for graphical people. When purchasing, viewing, using, and/or any other method applied to this publication you agree to the following statements. You, your next of kin, heirs or assigns release www.installuniversity.com, all other persons associated in the making, production, participation, and sale of this publication. Rephrased in plain English: When you purchase this CD, book, or view this web page you, your next of kin, heirs or assigns agree not to sue any associated persons with the publication for any accident or damage in ANY form (mental or physical to your car and/or yourself) because of this publication or your failure to heed proper safety, maintenance and/or modification procedures. You also agree that your next of kin, heirs or assigns cannot sue all persons associated in the making, production, participation, and sale of this publication. Perform all these installs at your own risk. Know how to use all of your shop equipment and take necessary safety precautions when performing ANY modifications and or maintenance items to your vehicle. Seek the advice of a paid professional and do not substitute this publication for the advice of a paid professional. This product is how we accomplished our installs and is not meant to be carved in stone. We are not responsible for a mistake, misprint, or any other error found in this guide. This guide is intended as a supplement and not to be your only source of information. Purpose: The lower control arms will increase the amount of traction your tires will have. You tires will stay more firmly planted to the ground over bumps and grab the asphalt a lot better on takeoff. Preface: Before you start into this install be sure to only do one side at a time. Your axle might slip or roll over if you remove both lower control arms at the same time. You might also want to have a friend help you during this install to help make the job a lot easier. Also, some people recommend placing your lower control arms in the freezer the night before you do the install so the bushings will contract and won't be so hard to install; it will be a tight fit. We used a marine grade grease recommended by Brett Rockey (BMR owner). You can find this grease at a local hardware store or local boating store. 1. We drove the front two tires onto a set of Rhino Ramps. We then placed the rear of the car on two jack stands making sure to place the jack stands to the inside piece on the uni-body. This is so we could have enough room to beat on the end of the lower control arm to get it into place. You will notice in Figure 1 that the jack is under the wrong rail. It should have been moved over to the inside rail. We then let the floor jack down to the point where it was just touching the differential housing. This was done to try to help brace the rear end from shifting after we removed one of the lower control arms. 2. Now you have a decision to make. Do you want to remove the rear tires when you do this install? We suggest that you do because from our own personal experience, this makes this install easier. So, if you decided to not remove the tires then go ahead to Step 3. Otherwise, go ahead and remove your plastic lug nut covers and place the inside wheel lug cover to the side. You will then need a 3/4” socket and ratchet to remove the lugs off your car. If you car has the one black lug on each wheel then you have the security option on your car. You will need to get that socket because it is the only socket that can take that lug off. If you have never seen this socket before just check out your glove box. This special socket will slide right into the 3/4” socket when it comes time to take the security lug off. 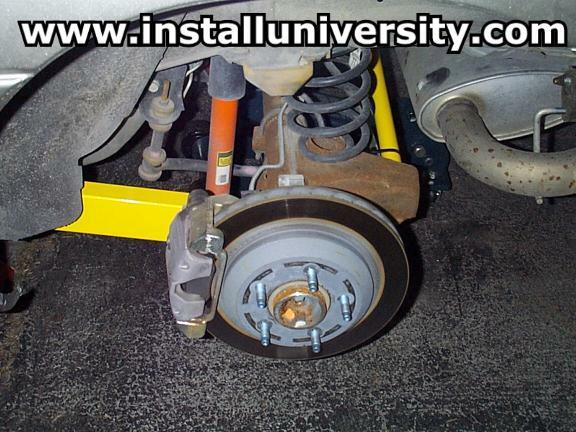 Just remove the wheel on the side of the car you are replacing the lower control arm on . Now that your wheel is off you have more room to work and a little better view of everything. 3. Go ahead and look underneath your car and identify the lower control arm on whichever side you decided to start on (see blue arrow in Figure 1). Now notice at each end of the lower control arm there is one bolt (see red arrows in Figure 1). You will need to take each bolt out using a 18 mm wrench and 18 mm socket/ratchet. Both ends will be a tight fit but we found the end closest to the front of the car was the tighter of the two. We placed the wrench on the bolt head side and the socket/ratchet combination on the nut side (you will need a mild deep well socket for this). However, the opposite combination should work just fine (you will need a short socket for this option). We found this end to be rather easy to install. If you have any problems getting the lower control up into the bracket, just put some grease on the sides of the bushings and beat it in with your rubber mallet. We just raised the lower control arm up into position. You might get lucky (we did on the first one) and find that the lower control arm hole and the bracket hole line up perfectly. If that happens then insert the bolt through the hole remembering that the bolt head stays on the outside of the car and the nut goes on the inside of the car. If the hole does not line up properly, this means that the rear end of the car has shifted. 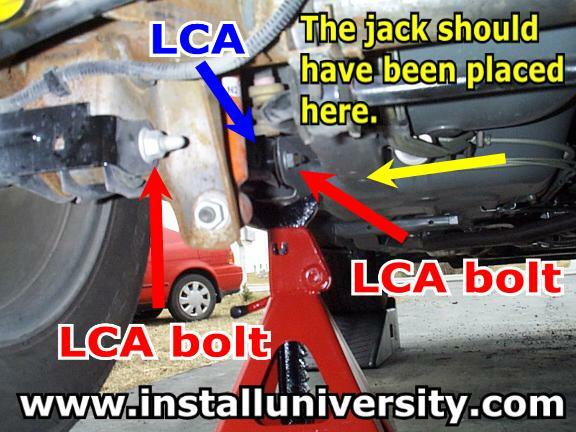 This problem is easily solved by raising up the floor jack on the rear differential housing until the holes line up. This is where a second person comes in really handy; they can pump the floor jack until you see that the holes are lined up. Note: If you have a poly bushing on one end and a rubber bushing on the other end of the lower control arm; be sure to mount the rubber bushing on the body side. 5. Now that we had our lower control arm in place with bolts back in and nuts finger tightened, we simply raised the rear differential housing up off the floor jacks about 1/4” so we placed the car in a “loaded” position. We then tightened up the bolts. The 1999 General Motors factory manual says to tighten the bolts to 74 ft-lb and tighten the nuts to 60 ft-lb. Now this seemed really weird to us but we did what it said. Update: Newer manuals suggest using 80 ft-lb so we have updated the following paragraph to reflect those changes. We are leaving the above paragraph like it is for comparison purposes. We also suggest using locktite as more and more people seem to have nuts backing off of the bolts. We simply tightened the bolt head to 80 ft-lb while one of us held a wrench on the nut. Then we swapped and tightened the nut to 60 ft-lb while one of us held a wrench on the bolt head. Don’t forget to do bolts on both ends. We forgot to do the front bolts and luckily remembered before we let the car down. Once you have the bolts tightened down, just let the car back down on the jack stands with the floor jack just touching the rear differential housing. Go ahead and grease your grease fittings. One to two pumps should get it, stop earlier if you start to feel some resistance. If you removed your tire you can now put it back on. You will need the 3/4” socket, possibly the security socket and torque wrench. Tighten the lug nuts up to 100 ft-lb using the star pattern (see Figure 2). You can learn more about this by referring to the General Motors factory manual. Don’t forget to place your plastic lug nut covers and the inside wheel lug cover back on. 6. Now repeat the process on the other side. Expect the process to speed up considerably on the second lower control arm install. We spent a total of 2.5 hours doing the total job. 1.5 hours on the first lower control arm while only needing 1 hour on the second one. The one hour on the second lower control arm included putting up all the tools. Good luck! Good luck! Comments: We had a shock tower brace and panhard bar installed on our car before installing the lower control arms. Wow! What a difference this modification made launching our car out of the hole. We can tell and feel the difference in traction and wheel hop. Our wheel spin has been greatly reduced. During a drive through some curves we could also feel the rear end feeling tighter and more controllable. We feel this mod has been the single best modification we have done to the car yet. You can see an outside view of the finished install in Figure 3. Be sure to occasionally check your nuts and bolts to make sure they are not backing off! Lock-tite would not be a bad idea to use on the nuts. Web Author: Eric Barger help@installuniversity.com Copyright © 1999 - 2002 Eric Barger. All rights reserved. Revised: June 07, 2007.